Start your journey in a lovely colonial city like Quito or Cuenca, with their fine building, grand squares and winding cobbled streets. Then head into the glorious Andes mountains to explore the beautiful Cotopaxi National Park and awesome sights such as the huge Quilotoa crater lake. You can even enjoy a vintage train ride on the newly-restored railway line south from Quito to the steamy coastal city of Guayaquil, via the famous Devil's Nose. Or travel down into the deep jungle of Ecuador's Amazon rainforest to enjoy the incredible bio-diversity of this amazing environment. Stay in a superb jungle lodge and venture out with our expert indigenous guides to explore the furthest reaches of the rainforest. And if you need some relaxation time, then head back over the mountains to Ecuador's beautiful Pacific coast, where you can enjoy long unspoiled beaches, some great beach hotels, and even activities like surfing or whale-watching in the gorgeous Machalilla National Park. 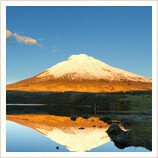 Our pick of the top places to visit on your holiday in Ecuador. Our guide to Ecuador's stunning wildlife and scenery, from the Andes mountains to the Amazon rainforest. The contrast in environments in Ecuador is staggering. From the snow-capped peaks of the Andes to the steamy Amazon rainforest and the golden beaches of the Pacific coast, you can experience more of Mother Nature's bounty in a week here than a month in most other countries. Even when you land in Quito, you are greeted with the sight of the lofty Pichincha volcano towering above the city, and just a short drive south takes you into the gorgeous territory of the Cotopaxi National Park which has as its centrepiece the perfect snow-covered cone of Mount Cotopaxi. You can easily just take a day trip out into the National Park from its Quito, and this is rewarding enough, giving you a chance to see giant Andean condors and some breathtaking views, but if you're feeling more adventurous then we can arrange for you to stay in the National Park and do some of the fantastic trekking available. Even without experience, you can actually climb some of the mountains in the park as well, so if you fancy getting a 5000m mountain under your belt, or perhaps the 6000m of Cotopaxi itself, then you won't have a better opportunity. Alternatively, the Andes are a fantastic place for mountain biking and white-water rafting, and there are some great examples of both available within a day's drive of Quito. Several of the haciendas that we work with in Cotopaxi also have their own horses, and horse-riding can be a great way to see some of the hard-to-reach sections of the National Park. Happily, however, many of the most amazing sights, such as the vast Quilotoa crater lake are easily accessible by road, and a trip out to Quilotoa is something we'd hugely recommend to everybody. If you've come to Ecuador for the wildlife, however, then there's really only one destination for you, and that is the Amazon rainforest. Although there are on-going problems with oil exploration in the jungle, happily Ecuador does also have some of the best-protected areas of the Amazon as well. Ecuador also has a record of involving indigneous communities in the ownership and management of tourism which puts most other countries to shame. Once you're in the jungle itself, you will be quite simply blown away by the variety of wildlife you can see. Ecuador is reckoned to be the most bio-diverse country on earth, and most of that diversity is concentrated in the Amazon jungle, so if you want to see families of chattering monkeys, huge flocks of iridescent parrots and macaws, and even the elusive jaguars, then the Amazon is the place for you. Less well-known, but also a biodiversity hot-spot, is Ecuador's beautiful Cloud Forest, which you can find on both the western and eastern slopes of the Andes as the mountains tumble down into the rainforest. This unique environment is home to wildlife such as the endangered Spectacled Bear, and if you don't have the time for a full jungle trip, or want to make sure you've seen all the wildlife Ecuador has to offer, then a short stay in the Cloud Forest can be a great experience. 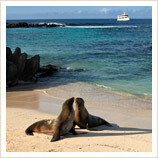 And all this is before you've experienced the delights of Ecuador's Pacific coast. The country has some excellent beaches, from resorts with 5-star hotels such as Salinas in the south, to Quito's favourite weekend beach-party desitination, Atacames in the north. In-between, you'll find everything from great surfing in Montañita to the pristine beaches and forests of the Machalilla National Park. Here, as well as enjoying lovely walks and long golden beaches, from June to October you can also take a trip offshore to see the annual migration of humpback whales as they travel south from Antarctica to give birth to their calves in the tropical waters off the Ecuadorean coast. From its grand colonial churches and buildings, to its ancient Inca ruins and still-vibrant indigenous traditions, Ecuador's culture is a melting-pot of influences and a joy for any visitor. Although most visitors come principally for Ecuador's natural attractions, one of the real joys of a holiday in Ecuador is spending time in its cities. Quito is certainly one of the most relaxed capital cities in South America, and its stunning colonial Old Town was one of the first UNESCO World Heritage sites to be declared on the continent. The colonial architecture and winding cobbled streets are immaculately preserved, and the churches are some of the finest in South America as well. Further south, the university city of Cuenca is, if anything, even more pleasant, and offers leafy squares and avenues, a beautiful cathedral, and a lovely historic riverside district. It's many people's favourite city in Ecuador in its own right. However, Cuenca is also the base for visits to Ecuador's most sizeable pre-Conquest ruins, however, at the Inca site of Ingapirca just to the north of the modern city. Here you can see an Inca Temple of the Sun and large-scale agricultural terracing which attest to Ecuador's history as the northern province of the Inca Empire. A favourite way to get to Cuenca from Quito is to take a trip into the Cotopaxi National Park and then further south to the city of Riobamba, from where you can catch a train down the newly-restored historic railway through the famous switchback known as "the Devils' Nose". This is part of a railway linking Quito with Ecuador's commercial capital, Guayaquil, located on the steamy Pacific coast. Although it's not Ecuador's most interesting city, it's often the base for flights to the Galapagos Islands, and offers a completely different perspective on Ecuador to the highland cities that most people visit. Although the conquistadors did their best to stamp out much of Ecuador's indigenous culture, they certainly didn't succeed, and this is another side to Ecuador which you should certainly try and experience on your holiday here. A great way to do this is to visit the town of Otavalo, where the huge weekly market showcases traditional crafts such as weaving, alongside the vital agricultural trading which has gone on here for centuries. Unless you are visiting the Amazon rainforest as part of your Ecuador holiday, then you may well get away without needing any new jabs or immunisations for Ecuador at all. For a closer look at which jabs you might need for which parts of Ecuador, have a look at our Jabs and Immunisations guide to find out more. Since the 13th of March, 2000, the official currency of Ecuador has been the US dollar, making this one of the easiest countries in South America from a currency point of view, particularly as cash machines are widely available and take most UK bank cards. Have a look at our guide to Currency in Ecuador for specifics. 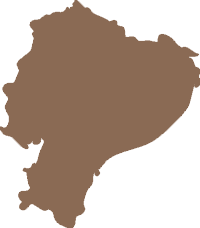 The Spanish spoken in Ecuador, and more particularly in the highlands, is generally held to be some of the clearest in South America, and many people visit cities like Quito and Cuenca specifically to study Spanish. 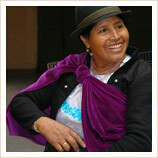 Our guide to Spanish in Ecuador has lots more information. 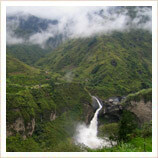 With an equatorial climate, Ecuador's weather is generally mild, with few extremes of heat or cold. However, you do need to bear in mind the change from the wet to dry season if you're planning on spending much time outdoors - have a look at our guide to the weather in Ecuador for more.